Col des Glières is a climbs at the very start of the French Alps. Starting from Le Plot, the first 10 kilometres average only about 2% so there is a chance to warm the legs up. And it’s worth warming up as the next 7 kilometres average 9%. Once the steep part starts there is a fantastic waterfall on the left that stays in view for much of the climb. I wasn’t quite in fit form yet and could have used one gear easier for much of the ride. But I worked hard and made it to the snowy top. 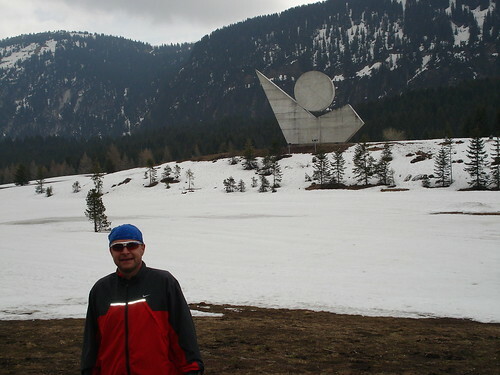 At the summit is a huge monument (and several smaller ones), commemorating the French resistance. The monument is supposed to represent a rising sign surrounded by two wings … one amputated. But it looks like a big rounded headed guy waving to me. I was lucky enough to have Doreen as a support car / cheerleader / photographer. So I stopped at the top and avoided a freezing descent.